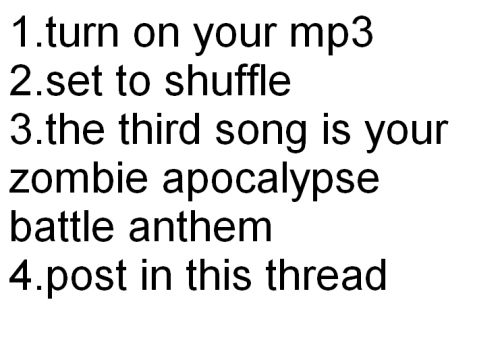 What's Your "Zombie Appocolypse Battle Anthem"? I'd say this constitutes a forum game. Of the thousands of songs that could iTunes could have played, mine was "Don't Stop Believin" by Journey. Hahaha doesnt really make sense but All Summer Long by Kid Rock. "Train in Vain" by The Clash. Coincidentally, I have never listened to it. And I don't intend to now. Too ominous. "Eaten By Your Love - The Kooks"
Fashion Zombies - The Aquabats! ...That worked out smoothly, I guess. Howl by Florence + the Machine. But Im not follwing the rules exactly because Im using windows media player because my MP3s screen is broken so if I put it on shuffle I would never figure out how to get it back. I only find songs because it has them in alphabetical order now lol. I got... Zettai Zetsumei by Tokyo Jihen. Which is weird because it means Stalemate or it could mean Desperate Stituation, I dunno. I'm going to die...?